Baby Giggles came out after Giggles and has a much better mechanism for initiating the giggling sound. Instead of clapping her hands, all you need to do is raise her arm. Both dolls have the same basic failure problem. 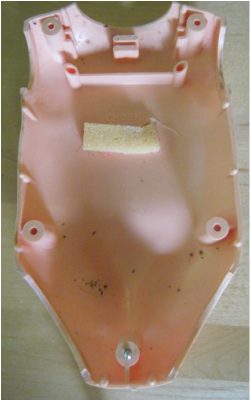 The membrane deteriorated and needed to be replaced. We used a section of a latex glove. We originally tried a piece of plastic bag but it did not have the elasticity to create a good giggle. This Baby Giggles was acquired through e-Bay and was a very quick fix. 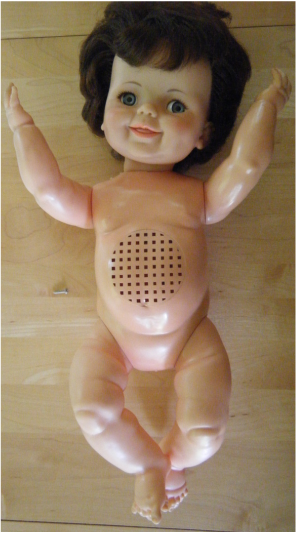 Raising the arm will cause the head to rock from side to side, rolling the eyes, and making the doll giggle through the speaker grille in her stomach. Raising the arm on the left (in the image) rotates the metal shaft which turns the white worm gear. As the gear turns, the neck is forced to rock which causes the eyes to roll. The same motion causes the heavy metal mass on the end of the cantilevered spring arm to oscillate. The oscillating mass pumps the membrane bellows in the tummy and creates the giggling sound. Opening Baby Giggles is easy - just 5 screws. This close up highlights the arm/neck/worm gear interplay. 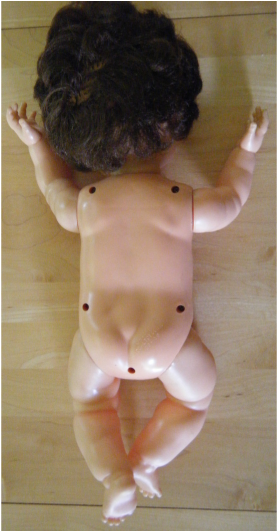 Here is the reason why the doll no longer giggles. 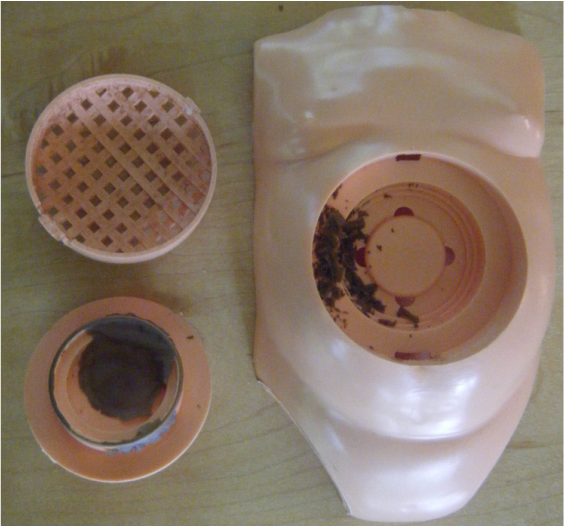 The rubber diaphragm has completely disintegrated. To fix it, pop off the grille and clean out all the residual rubber. Acquire a latex glove and cut a piece that will fit the old location. Reassemble the diaphragm making sure that the latex piece is taut. 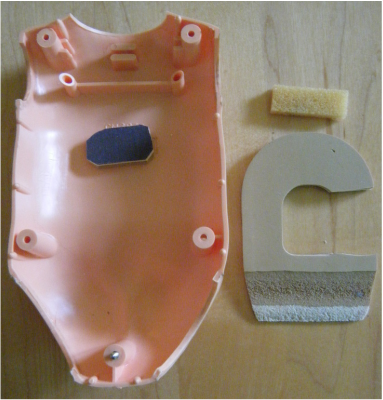 While the doll is open, you should check to see that this piece of foam is still intact and not deteriorating. It serves an important purpose that might not be immediately evident. 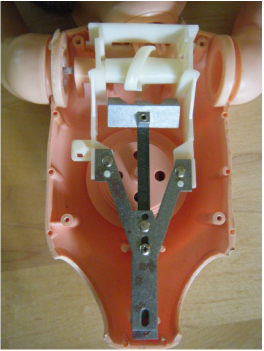 It dampens the motion of the oscillating mass and keeps it from "thunking" against the hard plastic body. I thought the foam was deteriorating and decided to replace it with a new piece of foam from a shoe insert. This turned out to be a mistake as the new foam completely damped the oscillating mass and prevented a sustained giggling. I ended up going back to the original piece of foam.